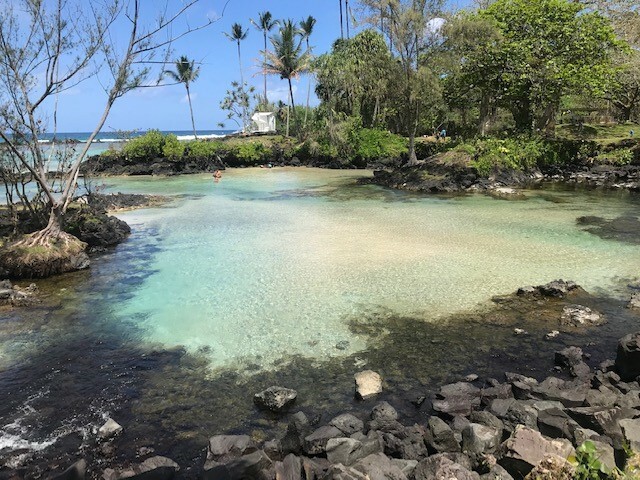 One of the beautiful beaches in Hilo, Big Island is Carl Smith Beach Park. Today’s level 4 blogger will talk about this beach in more detail. Carl Smith Beach Park is the most popular beach in Hilo. In there, we can swim with turtles and many kinds of fish, also, surfing and fishing. The water of this beach is brackish water where salt and fresh water was mixed. Its color is clear light blue and temperature of the water is low because of cool fresh water, so the local people sometimes go there to check their level of endurance. There aren’t big wave in this beach since the sea water is partly separated from the sea by rocks. Then it’s good to take children and let them play. There are many kinds of animals like ducks, fish, turtles, birds, and mongooses. At this beach, we can see long named fish called “humuhumu nukunuku apua a”. They are Hawaiian name for two species of triggerfish. If the weather is calm, this is a good place for snorkeling, and turtles often visit this beach. They prefer calm beaches more than wavy ones. Also, they come to there to eat seaweed and algae which is on the rocks. They are very friendly, but we have to remember not to touch them even if they swim up to us. Turtles are sacred animals for Hawaiians and an endangered species that are protected by the law. If we touch them intentionally, we will be punished. There are natural white sands there. That’s rare to see in Hilo because most of Hilo’s beach sands is black sand which was made by volcanic activity. Finally, this beach is near to downtown and easy to access. Also, the lifeguards keep their eyes on people who swim there, so we can feel relieved if we have not experienced so much with swimming or snorkeling. This beach is nice place to go on holidays.